Bringing art into our home sanctuaries allows us to express ourselves and create a space that is uniquely ours. Art has the capacity to transform our lives by surrounding us with beauty. Art can also be used as a meditation focus or for spiritual and creative inspiration. When most people think of art they automatically think of paintings and other forms of two-dimensional visual art. A few might include sculpture in the art category. In truth, there are many different forms of art that include both two-dimensional and three-dimensional art. Any of these can be used to decorate our home sanctuaries. We can also participate in creating some of these art works. Two-dimensional art includes paintings in a variety of media. Oils, acrylics, and watercolours are the most common. Other kinds of paint can be used such as tempera or even black and white wash. Drawings are also another form of two-dimensional art. These are usually done in pencil, but can be crafted from charcoal, ink, or marker. Etchings and prints are other types of two-dimensional art. These often can be pressed with ink or paints. Photographs also fall into this visual art category. Computer generated art and fractals can also be two dimensional. They either be printed out or left on the computer as wallpaper. In fact, any photo or uploaded piece of two-dimensional art can be used as computer wallpaper. When a computer has to be present within a sanctuary space, either as part of a creative space or because it can't be moved within the space, putting a meaningful image on the computer will help mitigate its electronic presence. Three-dimensional art is a broad category. Sculptures can be made from metal, stone, glass, ceramics, wood, or cloth. They can also be made with any combination of objects. Sculptures can include those that aren’t completely in the round, such as bas-reliefs. These are sculptures that are flat on one side so that they can be hung like paintings but protrude out in space. Three-dimensional art can also include enamel work and architectural elements. Some types of three-dimensional art can also be useful objects like glassware, dishes, furniture, jewelry, vases, pottery, and water fountains. Other types of art include textiles, gardens, and body art. Wall hangings, quilts, pillows, and some clothing can be so artistically crafted that they are true works of art. Garden designs and outdoor statuary can also be art forms. Finally, body art is yet another artistic form. Designs and pictures can be painted or tattooed onto skin. Henna on skin has been an age-old spiritual art form. Since there are many different kinds of art, made from many different materials, we can find objects of art that will not only fit our sanctuary spaces but also suit our personal and spiritual tastes. The thing we need to remember is that beauty is what we are trying to put into our spaces. Beauty is different for each person. Therefore, not every piece of art will be perceived as beautiful to every person. If we like classic art, we can look for art pieces that reflect that type of art. If we abhor traditional art forms, perhaps finding fractal art or modern sculpture pieces would be better choices for us. When we look for art, we must always remember that we are finding what we like, what moves us, what speaks to us. Our personal taste must drive our choices. An interior decorator, a family member, or what an old art teacher said about "good" art doesn't apply. We should choose what we like, what will make us happy and feel relaxed and rejuvenated in our spaces. Art can be placed almost anywhere in our home sanctuaries. Finding places is only limited by our imaginations. We can put paintings, wall hangings, or sculptures on the walls. We can even use paint to create murals, borders, or symbols on our walls as well. We can put statuary or sculptures on pedestals, shelves, or tables. We can move beautiful furniture into our spaces. These pieces don’t need to be expensive. They only need to have the artistic lines, colourings, or beauty that appeals to us. And, they also should be comfortable. We can display ceramics, including dishware, glasses, and beautifully crafted pitchers even in bedroom sanctuaries or in our spa rooms. These artistic objects don’t need to be restricted to kitchens. Every kind of sanctuary space can have art as part of it. Spa rooms can have beautiful photographs or paintings. They can also have artistically shaped decanters or containers for soaps, shampoos, or bath beads. Kitchens can have utensils, cookware, or dishes that have beautiful lines, colours, or patterns. Even workout rooms can have inspirational pictures on the walls. As we look for art objects, we should remember that art forms aren't all made by human beings. We shouldn't forget what nature has made. 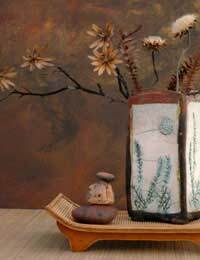 Driftwood, seashells, bonsai tree shapes, and even leaves and pressed flowers can be used in our art objects. Paintings, photographs, and sculptures that capture the beauty of nature are often healing and restful. Whatever art we decide to bring into our special spaces should be art that makes us feel at peace and content. It really doesn’t matter what form it takes or where it’s placed. A touch of art can make our home sanctuaries unique and even more restful.